Wednesday, May 1, 2013 Posted by Stefanie B. With its earthy color palette and softly worn exterior, a rust patina finish offers the surprise of unexpected beauty. From weathered bronze doorknobs and antique iron patio furniture to bed frames, fences and fire pits, this finish option has seen a resurgence over the past few years, particularly because of the rustic, unpolished look that's been made so popular in cities and other industrial areas. Rust patina is a simple oxidation process that forms on the surface of similar metals like copper, bronze, iron, and steel. When rusting metal chemically, metal artists can create reactions by introducing different elements to each other, turning the item a variation of colors. This finished product can have shades of orange, red, yellow, or brown pigments. Natural oxidation continues to occur with its exposure to oxygen, allowing items with a rust patina finish to gradually develop and change color over the years - sometimes fading, sometimes darkening. This process will accelerate when introduced to rain, sun, snow and other natural factors. Patina continues to be such a favorite finish for homeowners exactly because no single finish is alike. In an era where individuality is king and we're looking for any escape from the commonplace, this finish offers a versatile look for your entertainment space. It's been spotted coating accessories indoors and out; however, this finish really looks great under the warm summer sun. 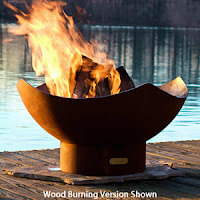 If you're interested seeing how a rust patina finish looks for yourself, you can review fire pits from a number of our vendors - all of who use this finish on their products. Fire Pit Art crafts unique fire pits made from re-purposed propane tanks. These handcrafted units are made in the USA and feature a durable 1/4" thick steel construction. 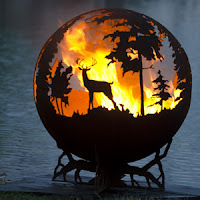 You may also want to check out Ohio Flame, a United States artisan who designs his fire pits with a special two piece weld so that they'll last through a lifetime of bonfires. The Fire Pit Gallery hosts intricate steel cut-out designs, featuring everything from a northern wildlife scene to a stylized sun. Sojoe fire pits turn into outdoor grilling units, while Patina Products allows you to cheer on your favorite sports team from around a cozy fire pit. Have you thought about replacing your outdoor fire pit lately? 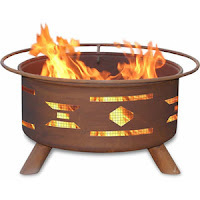 Do any of these fire pits look like something you would like for your own backyard?